As the nation’s #1 provider of fatherhood skill-building programs and resources, NFI provides guidance for practitioners and organizations on how they might be able to use to use the latest research on human behavior to enhance the effectiveness of their work with fathers. NFI provides this guidance in a series of blog posts called Research to Application: Guidance for Practitioners and Programs. The series is also available in the form of quick reference guides that you can download by clicking on the button at the end of the blog posts. The series offers a platform for generating dialogue among NFI, organizations, and practitioners on ways that research can be applied to addressing pain points in serving fathers. This post is the first one in the series and provides ideas on how you might integrate research on cues, triggers, and nudges. Integrating this research could make it more likely that fathers will habitually participate in a service, workshop, or program. It could also help fathers develop the habits of good fathering above and beyond reliance on the resources (e.g. programs/curricula) you might currently use. If you implement any of the ideas in this post, or develop and implement your own ideas, please share them with us at info@fatherhood.org. We’ll use your experiences to update this guide so it is even more useful. Research on power of habits in our lives, how to create word-of-mouth marketing, and how to create small and large-scale initiatives that improve decision-making provides insight into how organizations and practitioners might be able to use cues, triggers, and nudges to improve the effectiveness of a service, workshop, or program for fathers. Cues are stimuli in the environment that lead to developing a routine that is the basis for a habit. On the other side of the routine is a reward. (Cues, routines, and rewards go hand in hand in creating a habit.) Charles Duhigg in The Power of Habit describes the research on the power of habits and the role that cues perform in creating them. Triggers are “stimuli that prompt people to think about related things.” They are, quite simply, reminders to engage in a specific behavior. They are the foundation for word-of-mouth, which is the most impactful form of advertising/promotion for a fatherhood workshop or program. They help generate more word-of-mouth. Jonah Berger in Contagious describes the research on the role that triggers play in keeping behaviors top of mind (e.g. attending a fatherhood program) and in generating word-of-mouth (e.g. advertising a fatherhood program). Nudges are small changes in the world around us (environment) that influence us to make better decisions. More specifically: “Nudges are ways of influencing choice without limiting the choice set or making alternatives appreciably more costly in terms of time, trouble, social sanctions, and so forth. They are called for because of flaws in individual decision-making, and they work by making use of those flaws.” A nudge is not an economic incentive in which choice is eliminated (e.g. a father who owes child support will go to jail if he doesn’t attend a fatherhood program—a hammer, not a nudge), a motivator that has been used widely by fatherhood programs. Richard Thaler and Cass Sunstein in Nudge describe the research on how nudges improve decision-making. As Duhigg points out in The Power of Habit, it is easier for someone to establish good habits, and change poor ones, when part of a group (community). One reason why groups are so powerful in helping people to change behavior is that they help people see that change is possible (e.g. they see that it happens in others like them), which then makes it easier to believe that change is possible. Belief in the ability to change is critical to change. If you have seen fathers change as a result of participating in a fatherhood program, you know firsthand the power of groups. Cues, triggers, and nudges are very similar in that they involve the influence of stimuli in the environment—stimuli that in some cases already exist while in other cases they’re “introduced”—on individual behavior. They involve influencing the behavior of individuals that are part of a defined group (e.g. a customer segment or fathers). And, perhaps most importantly in working with fathers, they can involve influencing behaviors that individuals repeatedly perform. 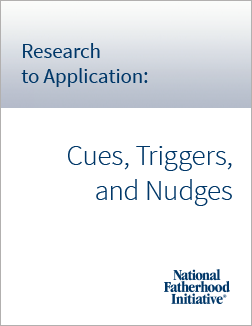 So for the purposes of working with fathers, the minor distinction between cues, triggers, and nudges is not important, even though it’s helpful to understand the distinction. Here is a list of ideas for integrating cues, triggers, and nudges into a service, workshop, or program that could help you address two major pain points—retention of fathers and consistent involvement of fathers in their children’s lives. Think of ways in which you could apply these ideas to each pain point. Have each father select an easy, frequent, strong (obvious) cue and a powerful reward for him to engage in the behavior (regular attendance or consistent involvement in his child’s life) that doesn’t exist in his environment. Choose a cue that is customized to each father’s circumstances (e.g. access to his children) and a reward that is, ideally, emotional so that it will stand a good chance of reinforcing the behavior every time he engages in it. As an alternative or in addition to working with each father, help your fatherhood group select a cue and reward that doesn’t exist in the fathers’ environments and that all of them can implement. Each father can report at the start or end of each time they get together on how well the cue and reward worked in helping him engage in the behavior. Have each father, or the group, identify bad habits that keep them from engaging in the behavior. This identification will involve naming the cues, routines (behaviors), and rewards for these bad habits. Research shows that you should focus on changing the behavior (routine) when trying to change a bad habit rather than trying to change the cue or reward. This idea involves identifying a competing habit (cue-routine/behavior-reward system) that keeps a father from regular attendance or consistent involvement in the life of his child. Help the father see how he can respond to the cue with the behavior you want him to engage in (rather than the competing behavior) and how the new behavior can be reinforced by the same reward. Call or send e-mail or text reminders to specific fathers or the entire group in between phases of a service, workshop, or program sessions as a trigger (reminder) to attend the next one or engage in a specific action of involvement in their children’s lives. This idea will keep the behavior “top of mind.” Consider asking each father at the end of his time with you or the group, for example, to identify a specific action he will take to be involved in his child’s life before you or the group see him again. Send an e-mail or text reminder, one or more times, to take that action before you or the group see him again. Create a “buzz” around a service, workshop, or program by getting graduates (alumni) to generate “ongoing” word-of-mouth by talking with potential participants about how much they loved/benefited from it. Link the behavior to a frequent trigger that already exists in a father’s environment. Consider what a father does on an every day (or almost every day) basis. Could you, for example, create a simple reminder card or magnet a father could attach to his bathroom mirror so that every time he shaves he’s reminded to attend the next program session? Link the behavior to a trigger that happens near where the behavior will or should take place. If a father receives a service or participates in another program at the same location as the workshop or program he also participates in, could you include a reminder as part of that other service or program to attend the next part or session of the fatherhood workshop or program? A nudge can involve a financial incentive as long as it doesn’t limit the choices available to a father. Some organizations have found, for example, that fathers who owe child support are more likely to attend a fatherhood program when the organization works with courts to reduce child support orders (e.g. make them more affordable) or eliminate some arrears in exchange for participation in the program. Consider non-financial nudges that have been used in other social-service programs or fields and see how they work with fathers. You could try journaling for instance. Encourage fathers in your program to journal daily or weekly about their attempts to become more involved dads. (Consider assigning journaling as “homework” between program sessions.) Some job-placement programs in the United Kingdom have found that when participants journal about their experiences trying to find jobs that they are more persistent in their efforts to land jobs. You could also implement a checklist of father-involvement behaviors tailored for your group (e.g. a group of non-custodial dads) or each father. Researchers in healthcare have found that using checklists in U.S. operating rooms that include procedures vital to reducing the risk of patient deaths actually reduce deaths. Similarly, fathers who use a father-involvement checklist might become more involved than they would otherwise. Regardless of how you apply cues, triggers, and nudges, approach your effort as an experiment. Keep track of what works with fathers in general and with specific kinds of fathers (e.g. custodial and non-custodial) so that you can apply what works in future work with fathers one-on-one or in groups, and avoid what doesn’t work. And last but not least, share your results with NFI at info@fatherhood.org so that we can improve future versions of this guide. The books The Power of Habit: Why We Do What We Do in Life and Business, Contagious: Why Things Catch On, and Nudge: Improving Decisions about Health, Wealth, and Happiness. A Practitioner’s Guide to Nudging @ http://www.rotman.utoronto.ca/-/media/Images/Programs-and-Areas/behavioural-economics/GuidetoNudging-Rotman-Mar2013.pdf. NFI's research on fatherhood is here. Don’t forget to look for more posts and reference guides in this series! Hausman, D., & Welch, B. (2010). Debate: To nudge or not to nudge. The Journal of Political Philosophy, 18, 123-136.